Launched from Tribunnews, Indigenous Papuans reject the plan of announcement activities of the Federal Republic of West Papua (NRFPB). The invitation spread through leaflets and through social media. 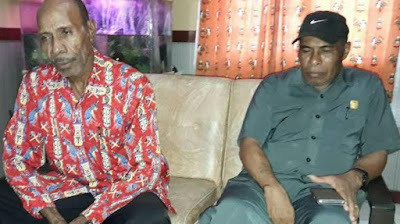 Ondoafi and Head of Jayapura Customary Justice Agency Boaz Enoch told reporters on Tuesday (31/7/2018) to urge the Papuan people not to be easily provoked by activities that could potentially lead to criminal acts such as NRFB. "Let us build this Papua, do not easy to do harmful activities," said Enoch in Kotaraja, Tuesday (31/7/2018). According to him, the activity is harming many people, including children. The land of Papua, he says, is a land blessed by God to feed the world. This land has also been set free by God. "Then keep things that are not profitable," he said. He also requested that individuals on behalf of NRFPB did not involve students. Because they are the future generation of Papua, to build this country. He even asked all parties to close the ranks and work together to build the land of Papua. Boaz also asks the TNI-Police not to allow unscrupulous elements. If necessary to secure them and take action under the law in force in NKRI. i place the same, Orgenes Kaway, Representative of the Tribal Council of Sentani Tribe says, we are now preparing for the 73rd anniversary of the independence of Indonesia on 17 August. Therefore, no longer divide the integrity of the Unitary Republic of Indonesia (NKRI). He said Papua had been granted rights through Law Number 21 Year 2001 on Otsus to build Papua. "If you want to establish your own country is not possible," said Orgenes. The OPM issue, he said, was halted in 1961 after integration through the Pepera. As a customary person, he appealed to anyone to work according to his profession. No more groups to divide unity. "My freedom to speak is prosperous, my suggestion to all generations, be aware, as long as we exist, we are given the authority to build this land of Papua," he said. "What independence are they demanding?" In fact, every citizen in Papua has the same rights, no one is discriminated against, and even Papuans get many features that we should be grateful for. " "Perhaps the main problem is that Papuans are very poor in digging for independence so that they are left behind by other brothers, the land of Papua is wide spread but the modern farming is non-Papuan, our sea is very rich but the fishermen are on average non-Papuan, many but who become non-Papuan carpenters so we have to do is build human resources in order to be able to dig and fill independence, not think independent even inhibit development, "he said.